The Heated Outdoor mat for snow melting. This 3x10 feet BLACK mat with 10 foot cord comes with standard 120 volt AC plug and built in GFCI. The Heated Mat runs on standard 120 volts AC and can can be plugged into a standard 15 amp circuit. All electrical components are UL listed. 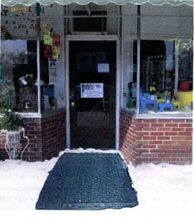 Mats reduce slip and fall incidents, reduce damage to floors and walkways from salt and calcium and keep walkway/door entry dry. The Heated Mat, if used in an indoor vestibule, will also provide additional radiant heat and melt away any snow carried into the entry way. The Heated Mat can be cleaned with mild detergent and water. Click here to return to the full list of Heated Mats.